Wearable devices just got pushed a bit further toward a brighter future. 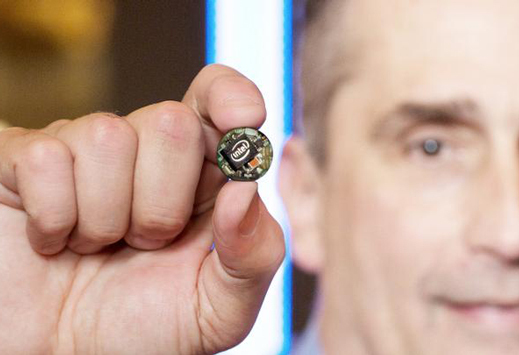 Intel CEO Brian Krzanich showed off a button-sized phenomenon during his keynote speech at CES this year, which is a chip based on Intel’s Quark SE, and manufactured especially for wearable technology. The chip is named Curie, and is appropriate for devices that have applications that run round the clock, such as fitness trackers. Although it can carry on functioning all day long, it has been built in a way which will help conserve the battery power with the help of the power-efficient Quark SoC along with low-power sensor hub and BLE or Bluetooth Low Energy technology. Curie is also capable of gesture-recognition, and has a six-combo sensor with an accelerometer, gyroscope and a pattern matching accelerator for identifying patterns to serve the purpose. To demonstrate the efficiency of Curie, Krzanich showed a smartphone built by the company with an app to work with the module. The device could track steps, and he showed the screen to the audience that read that Krzanich had taken 1,788 steps during the speech he was delivering. So far, Intel has produced only one wearable device: the Basis Peak fitness smartband. But their plan for Curie is stretched further. As of now, Intel plans to utilize the capabilities of the chip by contributing more to the wearable technology, and they plan to do so by partnering with other companies. Its latest partnership is with Oakley, an eyewear maker, and together they plan to make a smart eyewear for athletes. Intel is also knows to be forming a collaboration with the Luxotica Group, infamous for brands such as Giorgio Armani and Ray-Ban, to create more wearable devices. Curie will be available in the second half of 2015 because Intel is still waiting on Federal Communications Commission for an authorization.